The Pre-Sloane Emily didn't go to parties, she barely talked to guys, she didn't do anything crazy. 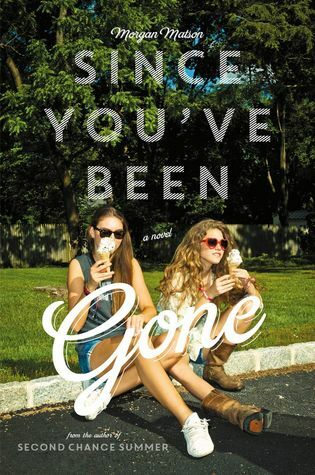 Enter Sloane, social tornado and the best kind of best friend—the one who yanks you out of your shell.But right before what should have been an epic summer, Sloane just... disappears. No note. No calls. No texts. No Sloane. There’s just a random to-do list. On it, thirteen Sloane-selected-definitely-bizarre-tasks that Emily would never try... unless they could lead back to her best friend. Apple Picking at Night? Ok, easy enough.Dance until Dawn? Sure. Why not? Kiss a Stranger? Wait... what? awwwwww!!! Okay, this book was just too much! So so so so good!! I was worried that because this book has been so hyped up that it was bound to let me down, but it didn't. It didn't even come close! This book was sent to me for review by Simon and Schuster, and I am SO glad that they sent this to me! I also received a copy of this book in a giveaway, and will now have to do a giveaway myself! This book ended up being so much more than I expected it to be! The character development in this book was outstanding. When we first meet Emily she is lost, shy, reserved and very awkward. This girl completely grows into her own person by the end of the book, but not in a way that she's not herself anymore, but in a way that she's finally grown into her own skin. I feel like without Sloane's list Emily would never have made the progress that she did. Emily makes you want to step outside of your comfort zone, while reading this you will find yourself saying, if she can do that, so can I! Which of course, you absolutely can. I found this book to be empowering and is a new favourite of mine. The list Emily receives from Sloane is executed to perfection, sometimes not in the way you would have expected. While Emily had the help of her new friends, she ended up doing most of these tasks alone, which I really enjoyed because it takes guts to do something that scares you all by yourself. I also have to say that my favourite task on the list was to "Hug a Jamie" :) for obvious reasons! I have to say, I loved the characters in this book. Ive said it before and I will say it again, characters make and break books for me. The characters in this story only enhanced the story to greatness. Emily was so relatable in so many ways, Frank, who seemed so perfect, turned out to be a whole different kind of perfect, Dawn and Collins were fantastic side characters and Sloane was wild and fun and it was so obvious why Emily loved her so much. I have to say this book has made me miss some of my friends who I've had to move away from and just makes me want to get back in touch with them. If you are looking for a great summertime read that is all about friendship and taking chances, this is the book for you. This book will not let you down, this will guaranteed be on my favourites list for the year! Every time Emily completed a task on her list!